Dhu al-Hijjah (Dhul Hijjah) is the twelfth and final month in the Islamic Lunar Calendar, marking the end of the year. This is the last sacred month in which fighting was forbidden. It is also known as Zilhaj, Zulhijjah, Zul Hijjah. Dhu al-Hijjah (Dhul Hijjah): Literally means 'Lord of the Pilgrimage'. It is during this month in which the Hajj Pilgrimage takes place and pilgrims from all around the world congregate at Makkah to visit the Kaaba. The Hajj Pilgrimage is performed on the eighth, ninth and the tenth of this month. Eid ul-Adha, the 'Festival of the Sacrifice' is held on the tenth day. The sacred month of Dhu al-Hijjah (Dhul Hijjah) is one of the highly blessed months. The pious and upright companions of the Holy Prophet Muhammad (saw) and their first generation followers used to spend this month in prayers and supplications, particularly the first ten noteworthy days which have also been distinguished in Glorious Qur'an. Holy Prophet Muhammad (saw) had said that supplications made in these 10 days get a positive reply from Allah (SWT). Praise be to Allah (SWT) Who has created Time and has made some times better than others, some months and days and nights better than others, when rewards are multiplied many times, as a mercy towards His slaves. This encourages them to do more righteous deeds and makes them more eager to worship Him, so that the Muslim renews his efforts to gain a greater share of reward, prepare himself for death and supply himself in readiness for the Day of Judgement. Makkah during Qosai, great Grandfather of Holy Prophet Muhammad (saw), year 157 before Hijrah. 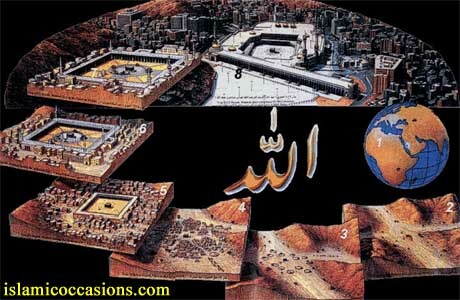 Makkah during Quraish, year 12 before Hijrah. Makkah during Omayied Era, year 91 Hijrah. Makkah during Abbasied Era, year 310 Hijrah. Makkah during Ottoman Empire, year 1215 Hijrah. Makkah during King Fahd bin Abdul-Aziz, year 1412 Hijrah. The approximate location of a hundred countries in relation to Kaaba. 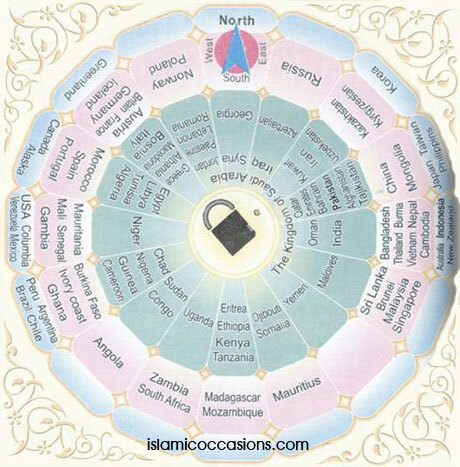 They classified into three categories with respect to their proximity to the Kaaba.